Oct. 16, 2017, 1:51 p.m.
By Laura Hazard Owen @laurahazardowen Oct. 16, 2017, 1:51 p.m. Loosen and Reimer (both from the Hans-Bredow-Institut for Media Research in Hamburg, Germany) and De Silva-Schmidt (University of Hamburg) analyzed 225 projects that were nominated finalists (not just submitted) for the Data Journalism Awards between 2013 and 2016, logging data sources and types, visualizations, interactive features, topics, and producers, to see how projects changed over time, how award winners differed from projects that were only nominated, and where there might be room for innovation and improvement. Why look at these projects? They’re “what the field itself considers to be significant examples of data-driven reporting,” the authors write, and the winners are likely to shape future development of the field. Another important group comprises organizations involved in investigative journalism such as ProPublica and The International Consortium of Investigative Journalists (ICIJ), which were awarded significantly more often than not (total: 18.2%, DJA-awarded: 32.4; only nominated: 15.4). Print magazines and native online media (8.4% each), public and private broadcasters (5.8 and 5.3%), news agencies (4.4%), non-journalistic organizations (4.0%), university media (3.1%) and other types of authors (2.7%) are represented to much lesser extents. Interestingly, stories by print magazines, news agencies and non-journalistic organizations have not been awarded at all. — It’s a lot of politics. Almost half the analyzed pieces (48.2 percent) covered a political topic, followed by “societal issues” like census results and crime reports (36.6 percent), business/the economy (28.1 percent), and health and science (21.4 percent). “Culture, sports, and education attract little coverage (2.7% to 5.4%).” Most of the projects also dealt with only one topic category, rather than “spread[ing] into two or more different topical areas (e.g. political decisions and their societal impact by investigating how weapon laws influence the number of mass shootings).” The authors wonder if this is a function of industry awards being biased toward more serious topics. — Data journalism is becoming more critical. Fifty-two percent of the pieces analyzed included “elements of criticism (e.g. on the police’s wrongful confiscation methods) or even calls for public intervention (e.g. with respect to carbon emissions)…This share grew consistently over the four years (2013: 46.4% versus 2016: 63.0%) and was considerably higher among the award-winners (62.2% vs. 50.0%”). — Most projects still rely on official (rather than originally collected) data. — Visualizations haven’t gotten much more sophisticated. Static images and charts were still found the most frequently; “typical combinations of visualizing elements include images with simple static charts (40.0% of all cases) or with maps (32.4%) as well as maps coupled with simple static charts (31.1%).” Award-winning pieces were more likely to be visually rich. — Interactivity is “a quality criterion,” but sophisticated interactivity is really rare. Zoomable maps and filter functions are most common, perhaps because they’re often already included with free software tools that data journalists are likely to use. “Our results are in line with others’ observations of a ‘lack of sophistication’ in data-related interactivity…they often include only ‘limited possibilities for the audience to make choices’ or ‘minimum formal interactivity’ simply ‘for interactivity’s sake. '” It’s also unclear how much audiences actually want interactive visualizations in news stories. 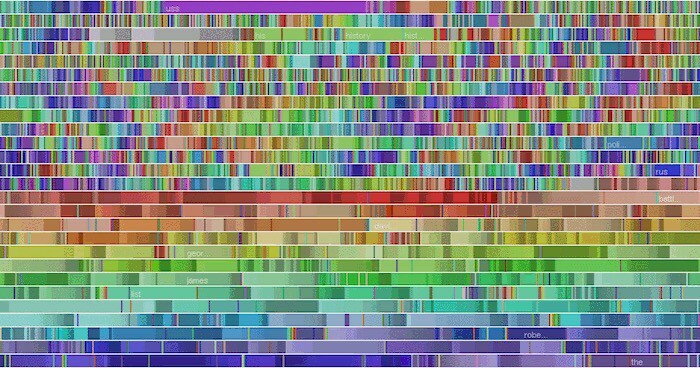 Visualization of Wikipedia edits by Fernanda Viégas used under a Creative Commons license. POSTED Oct. 16, 2017, 1:51 p.m.
Owen, Laura Hazard. "Not a revolution (yet): Data journalism hasn’t changed that much in 4 years, a new paper finds." Nieman Journalism Lab. Nieman Foundation for Journalism at Harvard, 16 Oct. 2017. Web. 25 Apr. 2019. Owen, Laura Hazard. "Not a revolution (yet): Data journalism hasn’t changed that much in 4 years, a new paper finds." Nieman Journalism Lab. Last modified October 16, 2017. Accessed April 25, 2019. https://www.niemanlab.org/2017/10/not-a-revolution-yet-data-journalism-hasnt-changed-that-much-in-4-years-a-new-paper-finds/.